The World Needs Problem Solvers – NOT Inept People With Qualifications! This post was first published on Wednesday, May 7, 2014 – on the temporary blogspot.com channel (click to see) I setup in May 2014, after spontaneousdevelopment.com, my 9 year old domain got taken over by a former hosting company. I’m moving it NOW, to THIS SD Nuggets blog – on TayoSolagbade.com which I used to replace the lost domain within days of the loss of the old domain. Do you want to be valued and respected? Do you want to immunize yourself against failure? Would you like your child to also enjoy the aforementioned benefits? If yes, you need to start deliberately developing real world relevant problem solving skills, and abilities, to complement any academic qualifications you pick up via exposure to formal schooling. People with problem solving skills – be it in the intellectual or physical realm – are frequently considered USEFUL, anywhere they go. It rarely matters if they are formally schooled or not. My 7 year stay in Guinness Nigeria helped me see that great value is placed on people with problem solving skills. And that inspired me to become one. Was just about to share this with a comment that I was taken on by a relative who questioned my deliberate skills based coaching of my kids, to the seeming detriment of their “formal schooling”. I explained to her that life taught me that having problem solving skills is way better than accumulating certifications. During my 7 year stay in Guinness, my degree in Agric Extension had little or no relevance to my work, initially as a brewer or years later, as Acting Production Manager. Instead it was my self-taught skill of spreadsheet automation using programming to solve brewery data recording and report generation problems, that made me shine repeatedly like a thousand stars till I left to do it as a business. And I met many support staff from foreign manufacturers of plants used in the brewery, who were often just technicians. The above insights made me resolve to put skill acquisition ahead of academic qualification. That’s why I never went back for a Masters, despite narrowly missing 1st class as Best Graduating Student from my department in 1992, at the University of Ibadan. It’s the reason I made a point of learning website development and marketing techniques. That skill has helped me repeatedly defeat efforts to sabotage my brand online, by attacking my website(like Monday’s event which has now made me decide to make major domain changes). Imagine if I had to pay a 3rd party to do such work each time it’s happened. I would be at his/her mercy. And s/he may not even deliver. Please note, that I say this with specific reference to my part of the worlds. People in developed societies face much better realities in this regard. All of the above insights made me buy my 10year old boy a complete electrical toolkit, after noticing his flair for fiddling with and fixing things, on his last birthday. My 10 year old son with his tools and a contraption he was building. Don’t be fooled by the rough appearance of what you see. 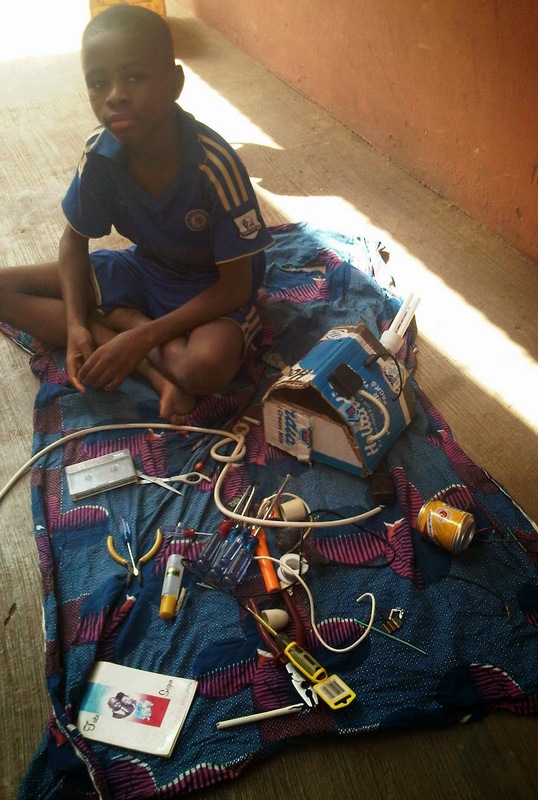 This young man actually makes stuff that work, and FIXES things too. I’ve written several articles with details of this. Today, he’s the goto guy for his mother (and the rest of us) when a plug goes bad, a bulb is bad, or even when an adaptor or phone charger won’t work. I’m doing a special PDF feature write-up on him by Friday 9th May 2014 – based on a recent discussion session I had with him, to find out what made him “tick”: He is SO INTENSE! Apart from that, since I developed my Pineapple peel based drinks and cakes made without oven in Cotonou last year, I’ve taught my 3 boys to make them, and they’ve been selling them in their school, making over 50% profits. Over a year ago, I made the eldest (who turns 15 in a few weeks time) undertake a 6 month weekend practical manual typewriting course with a private instructor in Ikeja. During this period, I would drive with him to the Lagos High Court area in Ikeja GRA, and make him watch the ladies who typed all sorts of legal documents for a fee, using beat up manual typewriters. We would listen in on their conversations, as they negotiated with clients who came in to have affidavits, and others documents typed for various purposes. Then, on eour way home, he and I would discuss what we’d seen. And I would often remind him that NONE of the women was ever asked to show her “certificate” – and yet some made well over N1,000 from an individual client. In just one day…! I continue working with my kids to refine their know-how as it relates to handling and using money they make using the skills I’m helping them acquire. I always try to share stories like this to challenge more people to go beyond paying lip service to empowering themselves, or their kids. Look carefully around you, and you’ll discover that people who get ahead in life, and achieve long term authentic success often get there by doing the above. You can – and should – emulate them, if you desire similar results! Title: The World Needs Problem Solvers – NOT Inept People With Qualifications! Haters Cannot Change Your Destiny!